What a surprising season 2018 proved to be! We started with extremely cold, wet and windy weather after the Easter holidays, which led to fixture cancellations and then the endless summer started, which proved to be fantastically hot at times. 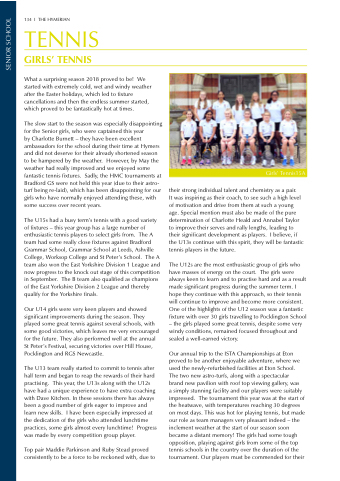 by Charlotte Burnett – they have been excellent ambassadors for the school during their time at Hymers and did not deserve for their already shortened season to be hampered by the weather. However, by May the weather had really improved and we enjoyed some fantastic tennis fixtures. Sadly, the HMC tournaments at Bradford GS were not held this year (due to their astro- turf being re-laid), which has been disappointing for our girls who have normally enjoyed attending these, with some success over recent years. The U15s had a busy term’s tennis with a good variety of fixtures – this year group has a large number of enthusiastic tennis players to select girls from. The A team had some really close fixtures against Bradford Grammar School, Grammar School at Leeds, Ashville College, Worksop College and St Peter’s School. The A team also won the East Yorkshire Division 1 League and now progress to the knock out stage of this competition in September. The B team also qualified as champions of the East Yorkshire Division 2 League and thereby qualify for the Yorkshire finals. Our U14 girls were very keen players and showed significant improvements during the season. They played some great tennis against several schools, with some good victories, which leaves me very encouraged for the future. They also performed well at the annual St Peter’s Festival, securing victories over Hill House, Pocklington and RGS Newcastle. The U13 team really started to commit to tennis after half term and began to reap the rewards of their hard practising. This year, the U13s along with the U12s have had a unique experience to have extra coaching with Dave Kitchen. In these sessions there has always been a good number of girls eager to improve and learn new skills. I have been especially impressed at the dedication of the girls who attended lunchtime practices, some girls almost every lunchtime! Progress was made by every competition group player. their strong individual talent and chemistry as a pair. It was inspiring as their coach, to see such a high level of motivation and drive from them at such a young age. Special mention must also be made of the pure determination of Charlotte Heald and Annabel Taylor to improve their serves and rally lengths, leading to their significant development as players. I believe, if the U13s continue with this spirit, they will be fantastic tennis players in the future. The U12s are the most enthusiastic group of girls who have masses of energy on the court. The girls were always keen to learn and to practise hard and as a result made significant progress during the summer term. I hope they continue with this approach, so their tennis will continue to improve and become more consistent. One of the highlights of the U12 season was a fantastic fixture with over 30 girls travelling to Pocklington School – the girls played some great tennis, despite some very windy conditions, remained focused throughout and sealed a well-earned victory.